Jeff Glucker September 6, 2017 Comment Now! Development on the Mercedes-Benz G-Class started way back in the early 1970s. This boxy brute is old. What started as a military machine has transformed into a status symbol of the wealthy. It's still capable, assuming you swap out the low-profile tires and aluminum wheels, but it mostly sees duty up and down high-end strip malls in Los Angeles. Regardless, Mercedes is finally updating the G-Class. Before that happens, however, Mercedes is offering a couple of final variants in Europe and a special package here on our shores. 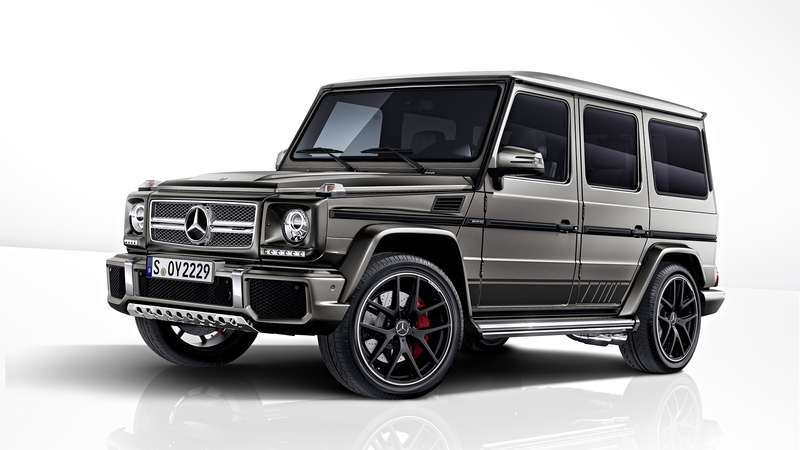 For Europe, Mercedes-AMG is offering up the G63 and G65 Exclusive Editions. You can probably guess what sort of engine sits under the squared off hood in each. The G63 delivers 563 horsepower and 561 pound-feet of torque by way of a twin-turbocharged 5.5-liter V-8. 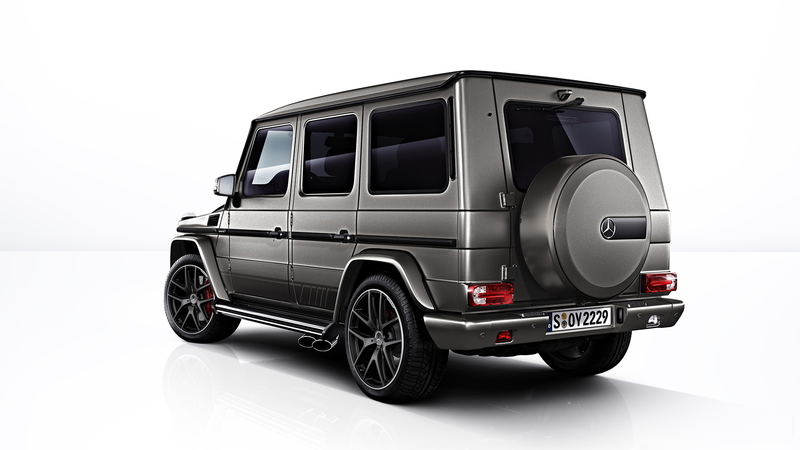 If that's not mental enough, the G65 has 621 horsepower and a mountain-moving 738 lb-ft of torque. The "standard" G63 and G65 versions have those engines though, too, so it's more the design elements that make these Exclusive. Mercedes-AMG has fitted the trucks with AMG racing stripes around the lower side trim. The rear spare cover is painted to match the exterior paint, and each version of the truck gets special 21-inch AMG lightweight wheels. Additionally, that Monza Grey Magno matte-finish paintwork you see above is only available on these Exclusive Edition luxo trucks. Inside, you'll find two-tone leather on the seats and more two-tone cow skin on trimming the instrument panel. A diamond pattern has been worked into the seats and door panels, and buyers can outfit their machines with either carbon fiber or piano black lacquer trim. Also available are red seat belts and leather-trimmed grab handles. Both are the hallmark of proper off-road adventures. So how much will all this Exclusive-ness cost? 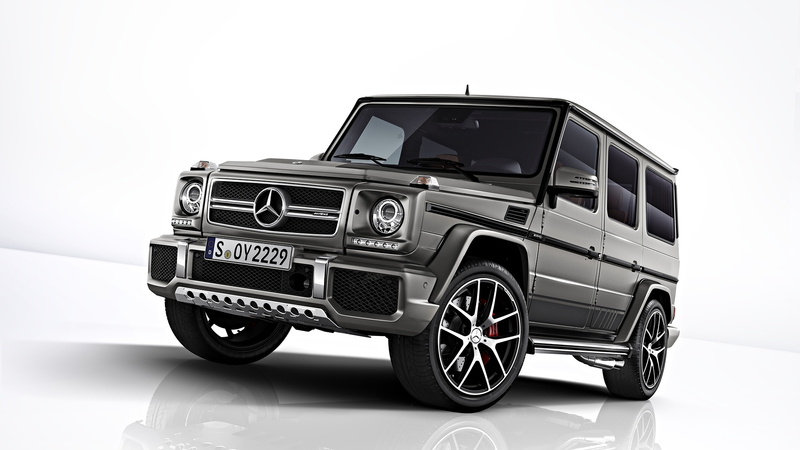 Doing a direct translation from Euros, the G63 will be nearly $195,000, while the G65 will run about $344,000. That's based on MSRP pricing Germany with the 19-percent VAT included. The version for the U.S. is more accessible. It's called the AMG Performance Studio Package and it runs $20,000 for the G63. It's not offered for the G65. The package includes much of the same stuff as the European version. It comes with the designo Monza Grey Magno paint, designo two-tone saddle brown leather upholstery, the designo Exclusive Leather package (AMG leather sport seats with diamond stitching), a two-tone steering wheel, underguard protection in chrome, AMG carbon fiber trim, outer protection strips in carbon fiber, the spare wheel carrier painted in the exterior color, and 21-inch AMG twin-spoke wheels. Choosing the package also requires you to take a $2,950 AMG carbon fiber interior package. That, with the $142,395 base price brings the total to $165,345. That's not cheap, but it's not $344,000 for a 45-year-old truck.